Md. 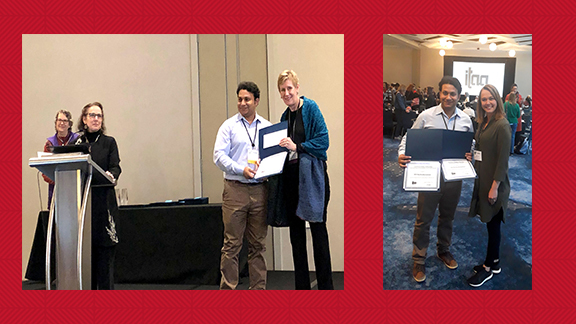 Rashaduzzaman, Ph.D. Student in Textiles, Merchandising & Fashion Design received two awards from the International Textile and Apparel Association (ITAA) on November 9, 2018 at ITAA's annual conference in Cleveland, Ohio. The two awards are "The Lois Dickey Fellowship: Outstanding Continuing Doctoral Student Award 2018" ($1,000 stipend) and "The Sara Douglas Fellowship for Professional Promise: Doctoral Student Award 2018" ($500 stipend). Last year Rashad was the recipient of ITAA's "Marjorie Joseph Fellowship: Outstanding Beginning Doctoral Student Award" ($1,000 stipend). Congratulations to Ph.D. student Md. Rashaduzzaman and his doctoral advisor Jennifer Jorgensen.